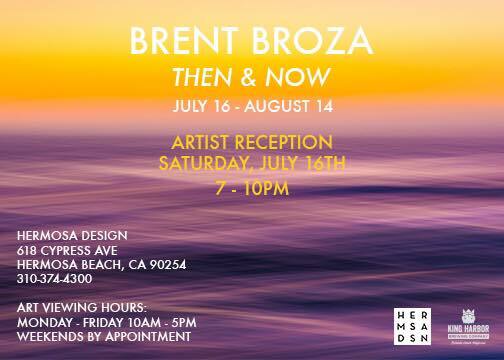 If you didn't get a chance to drop by the show, please join us for Brent Broza's closing art reception on Sunday, September 30th from 1-5pm at ShockBoxx Gallery in Hermosa Beach. Please join us for Brent Broza's opening art reception at Shockboxx Gallery on Saturday, September 15th from 7 - 10pm. The show features photos of Brent's captivating Fireline & Serenity blur ocean series. He will also be introducing some of his new, vibrant acrylic paintings. 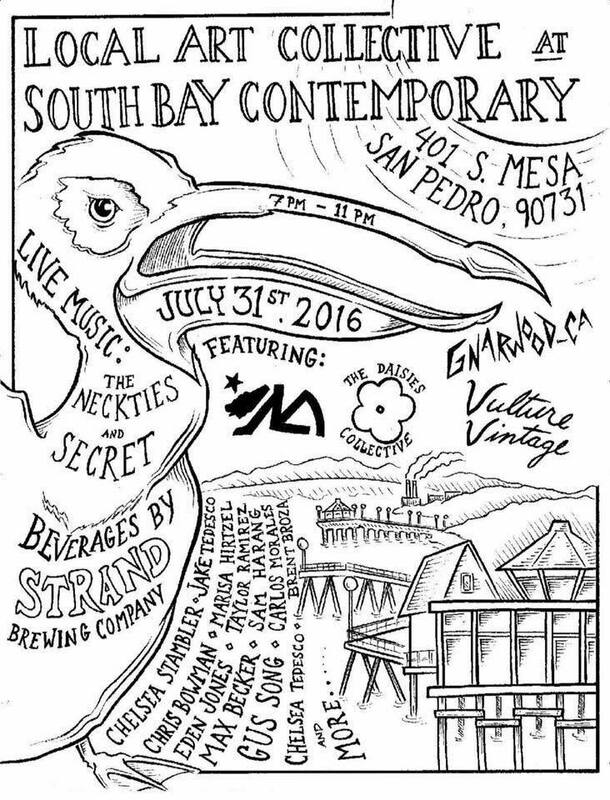 If you happen to be in the South Bay area, please drop on by for some art, music & beverages. Hope to see you there! We are thrilled to announce the collaboration of our 2 favorite ART shows, PUNK ROCK & PAINTBRUSHES meets STRENGTH. SURGE is a San Diego art show featuring the art of musicians, skateboarders and extraordinary women and men. We are featuring art from STEVE CABALLERO, BRENT BROZA, CRUSHOW HERRING, DANNY GREENE, ALPHONSO RAWLS, MATT HENSLEY, SOMA SNAKEOIL, COCO MILLION, LIBBY COY, TUESDAY, ERNIE LONGORIA& WADE YOUMAN. The event will take place Saturday June 1 in San Diego at BLACK PLAGUE BREWERY from 6-11 pm with the amazing Black Plague team as well as Marea COFFEE and so much more. Live music DJ sets, artisan area as well as food & ice cream truck. This event is all ages so please come join us and celebrate ART. Honored to be invited to the Punk Rock Bowling and Music Festival's 20th Anniversary art show, BROKEN FRAMES: Art & Images from the Alleyways from May 26-28 in Las Vegas. I am grateful to be included with this group of talented artists and musicians... I will be in Vegas on the 27th and possibly the 28th, so drop by and say hi if you are there! 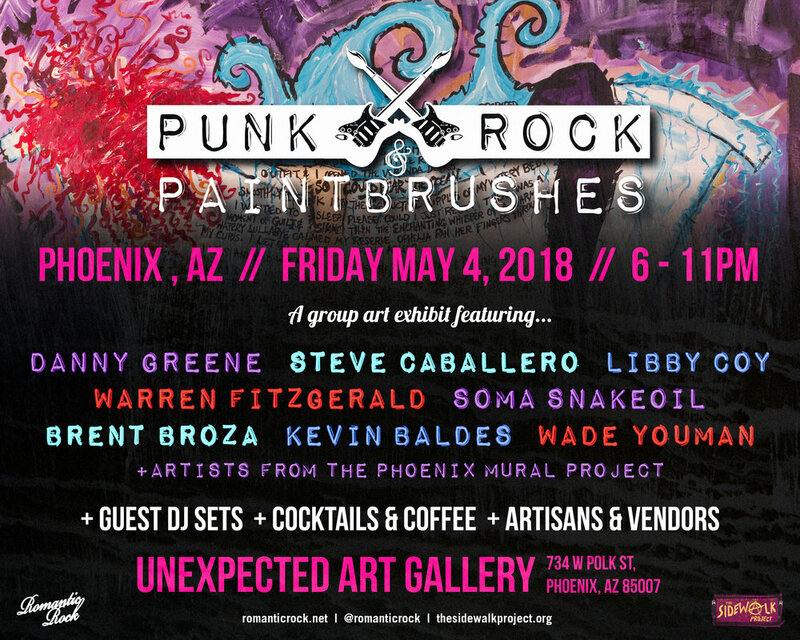 Punk Rock & Paintbrushes POP UP gallery at Sabroso! 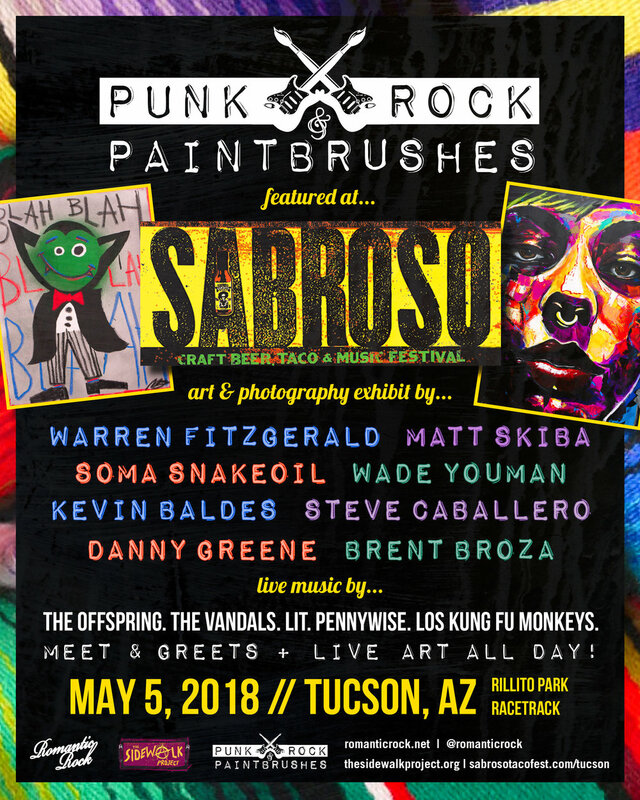 We are pleased to announce PUNK ROCK & PAINTBRUSHES art gallery will be featured at Gringo Bandito’s SABROSO Festival with live music by THE OFFSPRING, PENNYWISE, THE VANDALS, UNWRITTEN LAW, LOS KUNG FU MONKEYS & LIT! To accompany such amazing rock ‘n roll we are bringing these musicians and talented artists to the walls! Kevin Baldes of LIT, Warren Fitzgerald of THE VANDALS, Wade Youman oF UNWRITTEN LAW as well as MATT SKIBA, BRENT BROZA, SOMA SNAKEOIl, DANNY GREENE & STEVE CABALLERO will all be exhibiting their art and photography at our pop up gallery. YES we will have live art all day as well as meet & greets. We are SO excited to share with all of you the talent of these musicians are photographers& artists of our punk rock community! 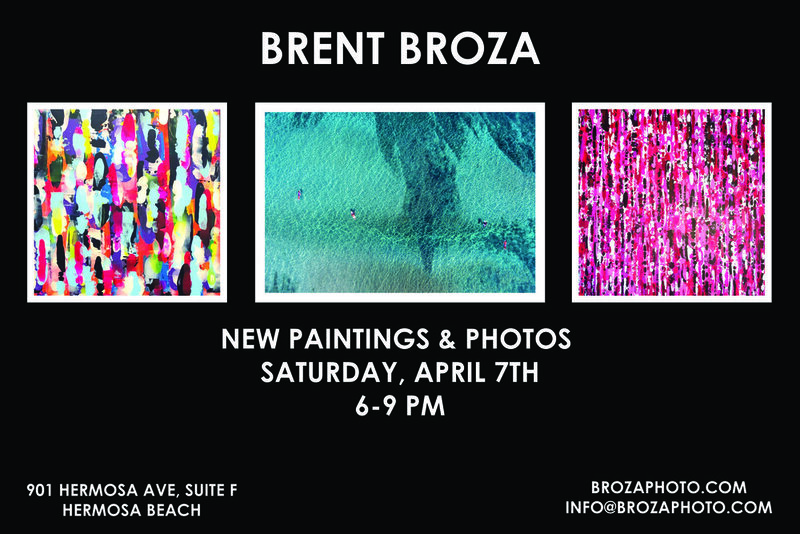 Please join Brent Broza at his showroom on Saturday, April 7th from 6-9PM as he will be featuring some of his new photos and paintings. The evening will also feature an open house with neighbors: Pacific Stranded, Lily Pad Floral Design & Later Days Coffee. Please drop by and grab a beverage! Please join me for my upcoming art show reception, In the Distance at Square Rhino Projects, Venice on Saturday, October 14th from 7-10PM. Although Summer has officially ended, in most of SoCal, that is simply a matter of the calendar, not our lifestyles. For some, it is an “Endless Summer,” especially if you happen to be a surfer, or subscribe to that culture. For photographer Brent Broza, every day is about capturing the glory of our charmed climate. Broza is a self-taught photographer who grew up in Manhattan Beach surrounded by the surf and skateboard culture. His passion for art, sports, and music began at an early age. His parents were also photography buffs, chronicling his early days and adventures in those activities, an interest which was passed along to their precocious offspring. He began experimenting with film photography in 2004, but it would be years before he considered it more than hobby. As an artist heavily influenced by his earliest surroundings, most of Broza’s photos involved landscapes, surf culture, musicians, and other artists. Eventually surfing took Broza on the road, from the South Bay, to a few years in Maui, looking for that perfect wave to ride, and other surfers to photograph. In Maui, he found himself with endless subject matter to shoot, from the astounding waves and pro surfers, to the dramatic and brilliant contrasting colors in the sunsets. One lucky day, he captured a photo of Aaron Gold on a Guinness World Record 63 foot wave in Maui, documented as being the largest wave ever to be paddled into by a surfer. The shot earned him the World Surf League’s “Biggest Paddle Award” in 2016. His passion for surfing has taken him all over the world, and his surf shots have been featured in Surfer Magazine, Surfline, The Inertia and others. Now an award-winning photographer, it is his Rothko-inspired horizon line photography that is most distinctive and truly striking. A solo exhibit, “In the Distance” at the new Square Rhino Projects in Venice, CA features his dramatic and captivating new series. Featuring work from his Fireline and Serenity series in this exhibit, his photographs of blurred horizons are often mistaken for oil paintings, especially as they are printed on canvas. These color-field abstract photos of sunsets and sunrises capture brilliant striations of color in softly blurred images, invoking the sense of tranquility one often feels when standing on the shore of a favorite beach. Living near the ocean his whole life, it is no wonder that Broza has been able to capture such a serene spirit in his work. If you are out and about in the El Segundo area this Thursday, August 17th, I will be the featured artist at South Bay Customs from 5-9pm. Drop on by for some beer, wine, food & live music! Please join us Thursday, April 27th at Watermans Hermosa from 7:00 - 10:00PM to benefit the Jimmy Miller Memorial Foundation. Brent Broza will be donating 14 framed 16×24 inch canvas photo pieces of which will be raffled off. In addition, he will also be offering (3) 24x36 inch framed canvas photos for a silent auction. There will be bowls at each piece, which gives you the option to select the piece that you may want to win. That means anyone with an entry raffle ticket has a chance to win a piece. You must be present to win! If you are out and about in the El Segundo Area next Thursday, August 18th, I will be the featured artist at South Bay Customs from 5-9pm. Join us Thursday, March 24th at Watermans : Restaurant, Bar, and Safehouse in Hermosa Beach. They will be playing a digital slideshow of my month long shoot at Jaws for their 6th anniversary. It starts at 7:30. Hope to see you there!